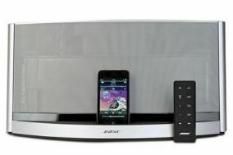 Bose SoundDock 10 review | What Hi-Fi? We first looked at the Bose SoundDock 10 when it was on sale for £700. A hefty price tag when you set it up against the competition. Forced to settle for three stars, largely on the basis of that price tag, the same dock is now back at a more enticing price. There’s plenty of it for the money, too. From a company known for its cinema systems with tiny speakers, this Bose speaker dock has a fair old footprint – and it’s heavy. That said, it doesn’t have the premium feel that others do, opting for sheer heft over design steel. Made for iPods and iPhones, the weapon up the SoundDock 10’s sleeve is Bluetooth support via an included adapter that allows wireless music from any Bluetooth device. There’s also the ubiquitous 3.5mm minijack input should you want to connect an alternative music source and a composite video output for sending video. Turns out the sonic character is not dissimilar to the dock’s appearance: big and powerful, but lacking a touch of finesse. Atli Orvarrson’s soundtrack to The Eagle demands dynamics and power for impact, something the Bose is more than happy to supply. The SoundDock 10 stops and starts sharply, hits impressive peaks and falls quiet when asked. There’s bottom-end grunt to burn and it can be cranked to party-starting volumes without brightening up or losing focus. Given the dimensions, you’d be right to expect nothing less. It’s an easy listen, too. The treble is smooth, the bass powerful – and it doesn’t feel stretched or threaten to tire. Regina Spektor’s Live in London album requires a more subtle touch. And this Bose doesn’t quite hold up to close scrutiny. Vocals lack the space to breathe and there’s not quite the detail you’ll hear elsewhere. Subtle inflections to vocals, piano keys, drums, are missing compared with the best in class. The remote control is a touch limited; the Bluetooth wireless playback, on the other hand, is versatile and useful if you have a compatible device. This more affordable SoundDock 10 is now an enticing proposition. Sonically it holds its own, and the USP of Bluetooth gives the big, bold Bose a boost – and could move it on to your shortlist.